Meet Grandma Gerarda. She’s got a chock full of stories and generations of recipes. The way her hands can sense the subtle stiffness, softness, buoyancy, and done-ness of dough is just magic! So for the first time ever, we’re doing a two-part series on delicious Italian goodies that are so easy to buy, the recipes fall to the wayside. Well, we’re preserving Grandma Gerarda’s traditions and sharing them with you! Grandma Gerarda has this superwoman strength for kneading potato dough. Yes, that’s potato dough for her traditional, handmade potato gnocchi. This recipe comes from Gerarda’s own grandma back in Naples, and she’s brought it to Queens, New York, where she’ll now be teaching it to you. 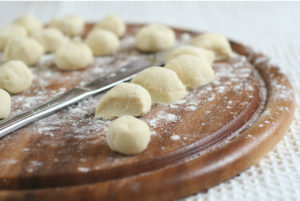 Come knead, roll, and eat Grandma Gerarda’s homemade gnocchi with her family’s favorite tomato sauce (which she’ll also be showing you how to make)! Hear the cultural stories that give deeper meaning to this classic dish. Leave with a satisfied soul. There’s mozzarella. 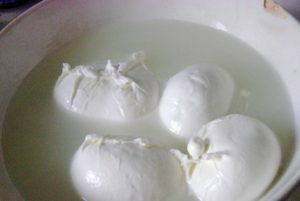 And then there’s Grandma Gerarda’s FRESH mozzarella. It’s softer, moister, warmer, gooier, and tastier! Watch Grandma Gerarda transform hard curds to long, taffy-like strands and ultimately, delightfully dense clouds of cheese. Learn her trick for braiding mozzarella, and then do it yourself! We’ll serve our just-made mozzarella with some of her family’s favorite snacks. 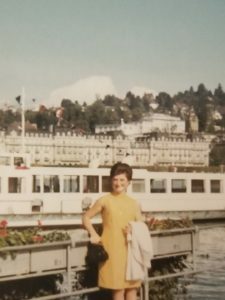 And in signature Cooking with Granny style, Grandma Gerarda will share her stories of leaving Naples for Flushing, Queens (where I grew up! ), and building an Italian-American community in beautiful, diverse New York City. 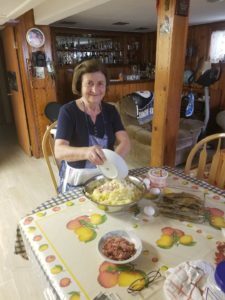 If you’d like to attend both cooking + storytelling sessions with Grandma Gerarda for $40 (and without the Eventbrite fees), email Cooking with Granny.